dadam's Super Stylish Riplus Mouse | OhGizmo! It’s already a week later, but since it’s nigh impossible for any one site to cover everything shown at CES, we’re still digging up interesting tidbits from the show for you. This one comes courtesy of the hard working folk at the AVING network who found this strikingly designed Riplus mouse, presumably at the dadam booth. As functionality goes it’s not going to take home any innovation awards, but that minimalist glass body with the technical bits hidden inside a black cross are really quite striking. It’s a hard sell though because I’m pretty sure that’s not a touch surface which means I can’t see any means by which one can easily scroll. But hey, they manage to keep this beauty under $2 and I’m sure they’ll sell truckloads! ← 3D Crayola Chalk – Is Everything In 3D Now? The design and material used are awesome. 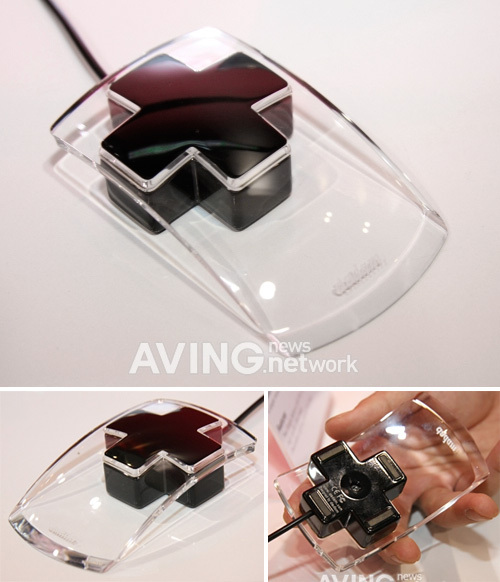 The glass material seems unbreakable and with its price, this will be a sellout.